Prime Minister, Minister Parly, Minister Pyne, Minister Payne, Minister Ciobo, the Honourable Christoper Penot, the Ambassador of France to Australia, Mr Herve Guillou, distinguished guests, ladies and gentlemen, our men and women of the Capability Acquisition and Sustainment Group, and men and women of the Navy. Thank you all for being here today on this very, very important day. As the Prime Minister, Minister Pyne and Minister Parly have all outlined today, the Strategic Partnering Agreement between Defence and Naval Group we will govern the delivery of the Attack class submarines over the coming decades. Moving forward from today we will continue to see a strengthening relationship between the men and women of the Australia and the navies of France and Australia in a most unique way. The Attack class submarines will meet Navy's capability requirements and they will be at the forefront of Australia’s Defence strategy and will help protect Australia’s security and prosperity for decades to come. With their inherent stealth, long range endurance and formidable striking power the Attack class submarines are a key part of our Navy's future. I thank every person that was involved in getting us to today's very important day of signing this agreement. In particular, Rear Admiral Greg Sammut and the team of the Future Submarine Program, have worked tirelessly to deliver this outcome. This marks the start of much more work but work that without this foundation would not be able to go forward. I thank you all for being here today and I thank you for the great work that you've done in getting us here today. 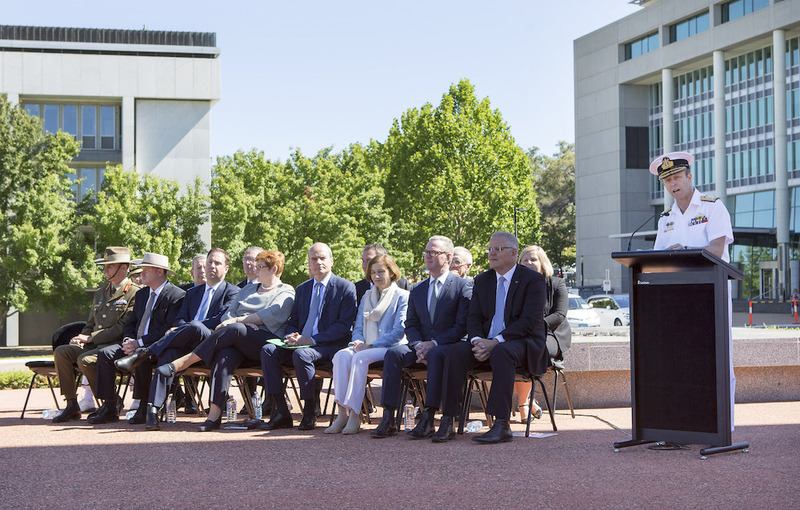 Chief of Navy, Vice Admiral Michael Noonan, AO, RAN (right), addresses the VIPs and attendees at the signing of the Strategic Partnering Agreement for the Future Submarine Program during a ceremony held at Russell Offices, Canberra.